At least 80 cm (30 in) between rows and at least 60 cm (24 in) between plants in a row. Sunny and protected from wind. End of January–beginning of March for seedlings. The seeds germinate in 10-20 days. It needs a lot of nutrients. Fertilize with barn manure. Use compost, algae brew or organic mulch. Water regularly 30 cm (12 in) deep. Don’t water on leaves. Beans, peas, broad beans, cabbage, Indian cress, calendula. Colorado beetle, mites, thrips and potato blight. If the fruits get brown (but not soft or rotten), the plant lacks nutrients and should be watered with nettle or comfrey brew. Cut regularly even if you don’t need them. Pick medium sized fruits so they don’t drain the plant. Store for a short time in the fridge. Use the fruits. The peel contains the most nutritional substances and shouldn’t be removed. 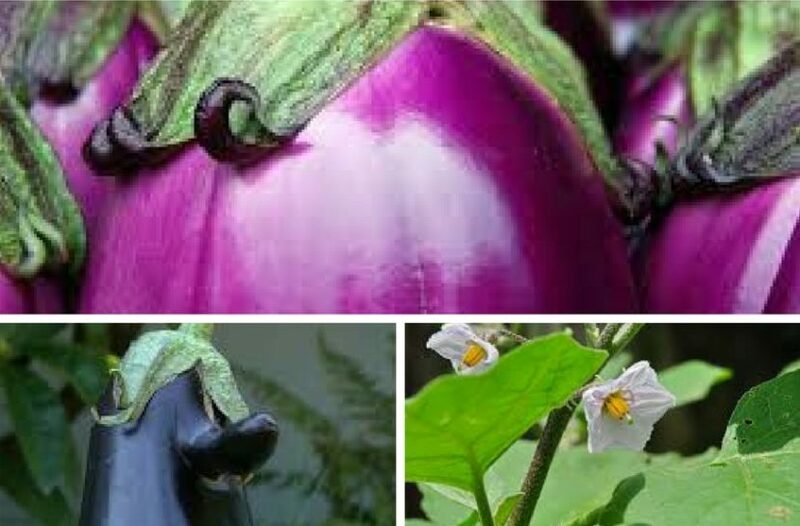 Eat eggplant fruits as fresh as possible, when their skin is tight and shiny. It loves warmth and sun. The fruits can be of various colors, all from white to different shades of violet. Old fruits are bitter and unpalatable.